The internet is a weird place, and over the course of the last few days, it’s gotten even weirder – thanks, in no small part, to an influx of moth memes. All of a sudden, they’re basically everywhere, punctuating absent-minded scrolls through Instagram and infiltrating our Twitter feeds, just simple moths in search of a light source. But why are they here, where did they come from, and what makes them so ridiculously funny? Allow us to (attempt to) explain. It all started back in July, according to Know Your Meme, when Reddit user No_Reason27 posted an up-close-and-personal shot of a glowing-eyed moth peering through his window to r/creepy. This absolute unit (seriously, in awe of the size of this lad), which amassed over 30k Reddit points, prompted u/drqxx to comment “Hey buddy you have any LAMPS? 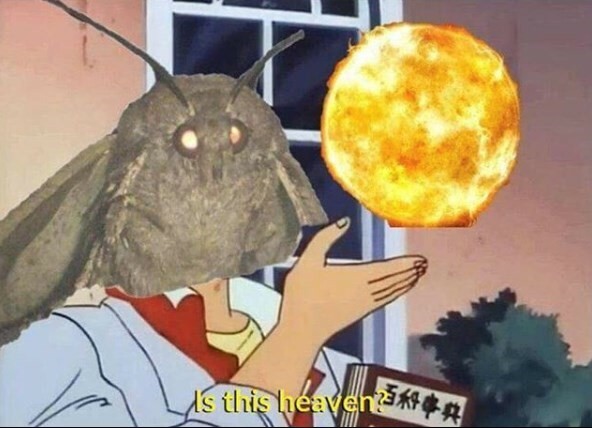 !” – and lo, the first moth meme was born. Throughout the summer, the moth meme bubbled under the radar, lurking in the shadows of the internet, until they finally blew up this week: in the last 36 hours, almost 3k of them have been posted on Instagram under the hashtag (surprise!) #mothmemes alone. What makes them special though, is the moth meme can be any meme. It’s a meta form of meme-ing. While memes are most often self-contained jokes, in which one image is used in a variety of scenarios (take for example Is This a Pigeon? and Distracted Boyfriend, which went viral earlier this year), moths are inserting themselves into every meme you’re already familiar with, creating a complex web of internet in-jokes. From Cats Wanting Fruit Loops and Guess I’ll Die, to Insecurity and Anxiety Texts and Drake Reactions – dear reader, there is a moth meme for that. There’s also the fact that these memes tap into the collective nihilism that permeates social media as a whole. The concept the memes all share is the nocturnal, winged creatures’ eternal, sometimes desperate quest for ‘lamp’, which in case you weren’t aware, often results in their untimely demise. While the exact reason moths are so attracted to sources of light isn’t proven, theories suggest that, because moths evolved at a time when the only light on earth were the sun, moon, and stars, and they navigated by those distant light sources, they’ve never quite gotten to grips with a porch light, or a campfire, or, ultimately, an open window leading to a lamp. Another theory, explored in the 1970s by entomologist Philip Callahan, puts forward the idea that the infrared light spectrum emitted by a candle flame is strikingly similar to the luminescent pheromones female moths glow with when attempting to attract a mate. “The male moth is highly attracted to and dies attempting to mate with the candle flame,” explained Callahan in a (contested) 1977 scientific paper. A tragic love story, if ever we heard one, and yet another reminder that life is, essentially, futile – in other words, the ideal premise for a successful meme.